What would you do if you lost everything, including your sense of who you are? Gene Hammett was faced with that exact scenario. 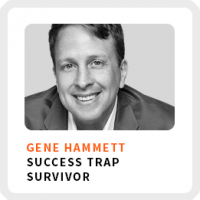 He says he fell right into the trap of success. Ignoring his inner voice caused him to lose his sports touring agency, his $500,000 annual income, most of his savings, his house, his self-confidence, and his sense of direction because of a $3 million business deal gone bad with his best friend. Devastated, he started to rebuild his sense of self and his professional life by turning to coaching. Now he’s more concerned with making a difference, not making as much money as he can. He wants to inspire others like you and me to live a life of significance and not just success. He explains the difference in today’s episode. Signs you are being trapped by success. Rebuilding your self-confidence. Gene built on his past positive experiences with coaching and focused on what he was good at doing. Keys to doing thought leadership right. It’s not about getting people to like you. It’s about taking a stand. Regains focus by: Working on one task at a time until it’s done. Unproductive habit: Underestimating how long it takes to do things. 90-day goal: Launching his book. 1) Look at your life and see what you want to let go of. 2) Stop consuming and start creating. 3) Find a clear vision.